Establishment scientists are trying to tell us that there is no reality beyond the physical. This has not been proved scientifically, so they use unscientific methods such as ridicule and power politics to force it on the academic community, blocking our knowledge of whole dimensions of reality, mental and spiritual. DIRTY SCIENCE exposes this corruption in our accredited academic institutions and calls upon the intelligent reading public to put pressure on them to clean up the mess. 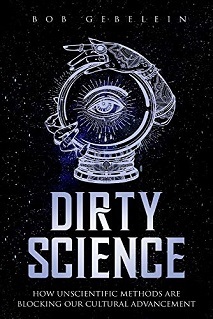 It gives examples of dirty science from scientists John B. Watson, Edward O. Wilson, Thomas Szasz, and a Dartmouth College textbook. It presents 3 simple rules by which to identify the unscientific arguments. It portrays the scientific establishment as an in-group and explains the unscientific arguments as in-group thinking. It shows how the biologists themselves have refuted Darwin’s theory of unintelligent design, but can’t admit it because their whole belief system is based upon it. It shows how the insistence on physical evidence has steered psychology away from the study of the mind and the legacy of Freud and Jung, which might have led us to a new civilization. It shows many of the illegitimate arguments used to dismiss legitimate findings in parapsychology.